A bike repair kit that can be signed out from the equipment desk at the PAC with a valid student card. Individual black lockers rent for $20/month, but availability is limited. Due to cost restrictions, there are no plans to expand the number of individual lockers on campus. Secure underground parking stalls are available for $10/month. There are lockers in the Agriculture and Health Sciences parkades. If a given bike rack is consistently full, please let our office know to see if racks can be moved based on demand. An extensive network of multi-use paths connects every building at the university, making it easy to get to campus and move about it during the day on a bike. 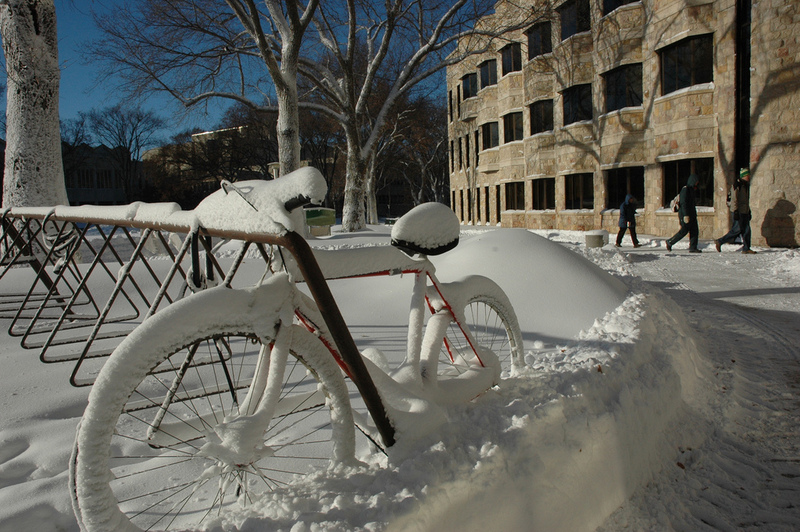 Bi-annual winter cycling workshops are offered through the Office of Sustainability and the USSU. Follow the U of S Office of Sustainability's Facebook page to stay up to date on our events. Bike theft is an unfortunate reality that we must deal with at the university. University campuses are some of the most targeted areas for bike theft, and while the university takes many steps to addressing bike theft including protective services patrols and adequate safety-focused lighting, the best defense is a high-quality bike lock used correctly. The U of S Bookstore now carries Kryptonite bike locks and will often discount them for special events. Once you have a high-quality bike lock, ensure that you are using it correctly. An expensive bike lock is worthless if it is incorrectly used. The University of Saskatchewan is home to a large selection of free bike racks. When used in combination with a high-quality bike lock these racks will keep your bike safe in highly visible locations (though be sure to take any expensive accessories with you if you are concerned they may be stolen). For those looking to take on added security, U of S Parking & Transportation Services rents secure bike lockers. Visit their website to learn more about opportunities and prices. Good quality outerwear will easily keep you warm in our climate—most winter cyclists simply wear a base layer, an optional mid layer, and a parka without having any issues with the cold. A set of goggles and a face mask will be your best friend at keeping cold winds out of your eyes and face. The multi-use paths at the university (and around the rest of the city) are fairly reliably cleared during the winter. Plot your winter riding routes along the Meewasin Valley Trail, the university's own path network, and the city's marked cycling routes. Unless you're riding a fat bike, steer clear of snow drifts. The larger the width of your tires, the better you'll be equipped to handle snow. A studded tire will be your friend on slippery pathways. One in the front is often enough (though a rear stud can help on particularly icy paths). Studded tires are often very affordable (e.g. <$100) and can even be made at home using an old tire and a set of screws. Bike to Work Day is an annual Saskatoon-wide event that occurs in May of every year. Businesses around the city (including the University of Saskatchewan) host commuter stations that offer morning bike commuters coffee, snacks, games, swag, and a variety of other activities. More information about Bike to Work Day Saskatoon can be found at their website. 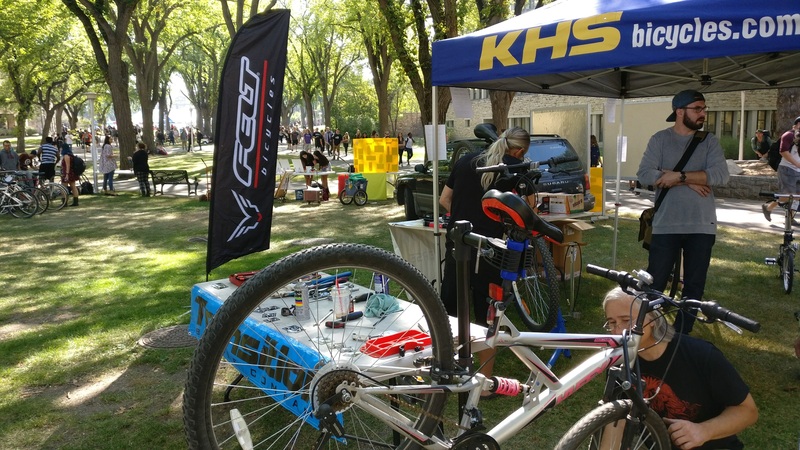 Come Bike to Work Day each year, be sure to visit the U of S commuter station at the corner of College and Wiggins for free coffee, snacks, music, and bike accessories courtesy of the Office of Sustainability and Protective Services. Hike Bike & Roll is an annual campus event that recognized and encourages active transportation - using your human power - to get around this winter. Join us in the bowl for a used bike sale, free smoothies, information, and freebies on how you can be sustainable, fit and healthy all year round! Each year we are joined by a collection of campus partners, Bike Universe who offers free bike tune-ups and advice, and the Bridge City Bike Co-op who hosts their annual campus bike sale for students, staff, and faculty alike who want to pick up an affordable bike for the year. Hike Bike & Roll is open to the entire campus community. For more information on Hike Bike & Roll dates and times, be sure to follow the Office of Sustainability on Facebook. The Office of Sustainability hosts regular cycling workshops on campus to help teach the community repair and tune-up skills and tips for winter cycling. These workshops are often advertised on PAWS and on the U of S Office of Sustainability's Facebook page. If you would like to arrange a workshop for your group on campus, please contact the Office of Sustainability and we would be happy to help arrange one for you. The Office of Sustainability was able to release its 2015 Cycling Infrastructure Report with the help of Student Planning Intern Mike Sliva. The report outlines the current state of cycling infrastructure around campus and makes several recommendations for future updates that will facilitate easier cycling for all staff, students, and faculty at the U of S.
Despite the numerous preconceptions we might have against using cycling as a primary mode of transportation, the truth is that cycling is healthy, sustainable, efficient, and fun! Here is just a list of cycling misconceptions and how you can battle them by climbing on a bike. "I'm too out of shape to bike"
Being out of shape is one of the primary reasons to jump on a bike! Biking is one of the easiest and most accessible forms of aerobic exercise: it is low impact, can greatly boost your heart rate (reducing your liklihood of heart disease), and scales in difficulty with the effort put in. To make it easier, try the following tips. Ride at an easy pace. In a few months you will find your overall fitness has increased and you can choose to ride faster if you'd like. Plot out your route on a weekend to find the easiest way to work. Choose something low traffic and relaxing to make your ride easier. "Biking takes too long to get where I need to be"
It may not take nearly as long as you assume it might. The average bike commuter travels at around 16 km/h. Due to other factors associated with cars such as traffic and parking, trips of less than 5 km are actually faster on a bicycle than by car. In fact, trips up to 15 km can take the same or less time by bike as by car. Considering the size of Saskatoon and the length of many commuter routes, the amount of time it would take to get to school or work would not actually change that much. When you combine this with the fact that the more you ride the faster you become, trips become quicker and quicker as you go. "It's too far for me to bike to work"
If you find that your commute is too long for you to cycle because of other factors (fitness, ability, etc. ), there are many other ways to supplement a cycling routine to shorten the distance. Try riding to work and taking mass transit home, then alternating the next day. This on/off method means you only have to cycle half the distance of your regular route. Combine riding and mass transit to shorten your route. Saskatoon transit offers bike racks to carry your bike whenever you need to. Combine your bike with a U-Pass or Eco-Pass for best effectiveness! Ride to a coworker’s house and carpool to work. This cuts the vehicular emissions between the two of you by half. "My bike is too beat up to ride"
You don't need an expensive or fancy bike to ride; almost any old bike will be able to do the trick! Saskatoon has many reputable bike shops who are able to do fast and inexpensive tune-ups to bring your old beater back into riding shape. The Bridge City Bicycle Co-op is a great example of a community organization that can help you fix up your bike for cheap. If you find that you are unable to maintain your bike yourself, identify a bike shop near your regular route to stop in for maintenance on the way home. Remember that you should never sacrifice bike quality for safety. Most bikes are safe enough to commute with, but be sure that a tune-up isn't skipped just to save money when it could save your life. "Biking makes me too sweaty for school/work"
The easy answer to this is that you may be riding too hard on your trip to the university! Try slowing down your pace to slow down the sweat. For those who enjoy a fast ride or who sweat through even an easy pace, the university is home to many shower facilities spread across campus. Leaving your morning shower till after you arrive on campus will leave you feeling refreshed for the start of your day. "I have to dress up for school/work"
Keep multiple sets of clothing at work and rotate them on days you drive. Changing after your bike ride will leave you feeling cleaner and more refreshed. Have work clothes cleaned at nearby laundromats or dry cleaners; it's even better if you can identify one along your route! Pack clothes with you and change at work. Rolling clothes instead of folding them will make them fit in bags easier and will reduce wrinkles. "I can't bike when it's raining outside"
Here is wear a great set of raingear will go a long way. A waterproof/windproof jacket will make that ride a breeze, and you can supplement as needed with waterproof footwear, pants, or headwear. Just as outfitting yourself for the rain is recommended, so to can you dress up your bike; front and rear fenders for your bike are inexpensive, easy to put on and take off, and will keep water from splashing up off your tires. Of course, there are days when the rain creeps up on us. Leaving an extra rain coat at work can help you always be prepared. However, if you're missing a coat and don't want to get wet, consider taking transit or carpooling to get home that day and ride your bike home the next day. Stopping at all lights and stop signs. To reduce the pressure of riding alongside cars, plot your route to stay on less busy streets; you'll find that a lack of cars often makes for a quieter and more relaxing ride, even if it adds a few minutes to your trip. Finally, always remember to practice safe cycling habits. Wear bright clothing when you ride to make sure that cars can always see you on the road (this includes equipping your bike with front and rear lights which, aside from being cheap, are the law), and always wear a helmet everytime you ride. "I have to run errands"
While you'll never have the same storage capacity as a car on your bike, there are lots of ways to equip your bike for light errand-running. Racks are available for all bikes that can be bolted to the back of your frame to add extra carrying capacity. For an extra bit of flare, consider adding a front handlebar basket for carrying odds and ends. For larger loads, there are even small bike trailers that can hitch easily to the back of your frame.